Knee arthroscopy is a procedure performed by orthopedic surgeons in which a small camera, known as an arthroscope, is inserted into the skin to examine the knee joint. The camera produces an image on a TV monitor, which assists the doctor guide surgical instruments when diagnosing and treating knee ailments. Knee arthroscopy surgery is extremely common because of its minimally invasive nature. Patients who undergo knee arthroscopy generally do not experience lasting side effects or discomfort associated with larger knee surgeries. The knee is the largest joint in the body. It is made up of the lower end of the thigh bone (femur), the shinbone (tibia), and the kneecap (patella). Other significant components of the knee include articular cartilage, synovium, meniscus, and collateral and cruciate ligaments. The articular cartilage is what helps the multiple knee bones to work smoothly with one another. The synovium is the thin lining which lubricates the entire joint. Two wedge-shaped pieces of meniscus cartilage act as buffers between the thigh bone and shinbone. The ligaments, of which there are four, hold the bones together and keep the knee secure. 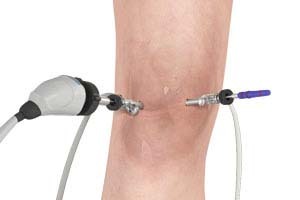 When a Knee Arthroscopy is Utilized? Medial and lateral meniscus tears are generally twisting injuries and occur commonly to competitive athletes. These injuries can also occur when standing or elevating oneself from a squatting or sitting position. Especially as people age, meniscal cartilage becomes weaker and is hence more likely to experience a tear. Torn cartilage can be felt as intense pain on the inner or outer side of the knee, as swelling, as inhibited mobility, or as knee locking, especially if the cartilage becomes lodged between the multiple bones of the knee. Meniscal tears unless extremely small do not generally heal easily on their own. As tears increase the likelihood of arthritis developing within the knee joint, it is often advised to remove the torn piece of cartilage. If the torn cartilage is not removed, pain, swelling, and joint-locking are likely to persist. Once the torn cartilage is removed, however, symptoms are likely to subside, and a full recovery is expected. In repairs such as these, patients are generally advised to avoid competitive athletics or intense weight bearing activity for at least three months. Articular cartilage is surface cartilage. When it tears, shock absorption in the knee is greatly inhibited. Often, pieces of surface cartilage become dislodged and “float” within the knee, sometimes with piece of bone attached, which can cause the knee to lock and deteriorate. Very often this injury will lead to osteoarthritis if not treated correctly. Arthroscopic surgery can help patients with articular cartilage injuries progress to a healthy recovery. The torn or ruptured ACL is a common injury in competitive athletics. You’ve likely witnessed this injury occur to one of your favourite athletes. When the ACL is ruptured, the knee becomes extremely unstable and reconstruction is required before a return to previous use can be expected. In ACL reconstruction, the arthroscope is used to aid in the building of a new ligament to replace the torn one. Kneecap disorders such as maltracking and significant surface tears are often treated with arthroscopies. Very often, if the injury is isolated, kneecap injuries can be rehabilitated with physical therapy. Baker’s cysts, or popliteal cysts, often result in patients who endured a torn meniscus or have worn articular cartilage in the joint. These fluid-filled cavities can occasionally rupture, causing significant pain in the calf muscle. If they do not burst, and there are no symptoms associated with the diagnosis, often they will be left alone. In the case that Baker’s cyst treatment is required, and a patient does need a cyst removed, arthroscopies will aid the procedure. In comparison to other significant knee surgeries, knee arthroscopies do not generally experience great pain or discomfort following the procedure. As with all surgeries, it is normal to experience swelling for a number of days after the procedure. Using ice packs for about twenty minutes three to four times a day will aid in speeding up the recovery process. Pain medication will also be provided based on the patient’s level of pain. Bandages will wrap the operated knee and should not be removed without the doctor’s recommendation. Knee arthroscopies have limited beneficial effects on knees which already suffer from osteoarthritis. The surgeon will provide instructions regarding physical therapy and general rehab following the procedure. It will be recommended to patients who undergo this procedure to strengthen the hamstrings and quadriceps as soon as possible, as this will aid in the recovery process. Most recoveries take place anywhere from 2-8 weeks after the surgery, depending on the complexity and scale of the procedure. Competitive athletes should expect a similar time frame before returning to the field. How long will I be in the hospital for knee arthroscopy? Do I need crutches afterward? You will not need crutches afterward unless you have been told otherwise by Dr. Patel. How long after can I get the knee wet? How long after knee arthroscopy can I drive? Dr. Patel recommends waiting to drive until you can walk without assist and are not taking any narcotic pain medications. How long until I can return to work? You can return to work as soon as your knee feels comfortable and are not under the influence of narcotic pain medications. How long after can I swim? You cannot submerge your operative extremity in a pool, hot tub, bath tub, etc until 4 weeks after surgery. Usually it takes 2 to 8 weeks following the surgery to recover after a simple arthroscopy procedure.